Bangkok (Thailand) – September 26, 2018 (travelindex) – In order to thank members of the website www.tourismthailand.org/newshadeofluxe the Tourism Authority of Thailand together with our leading allied, both in products and tourism services, are offering the members a special luxury traveling experience which includes numerous accommodations, spas, and transportations. They are Pimalai Resort & Spa, The Sukhothai Bangkok, Phu Chaisai Mountain Resort, Rayavadee, Divana Spa, Le Meridien Suvarnabhumi, Bangkok Golf Resort & Spa, Sofitel Krabi Phokeethra Golf & Spa Resort, Silavadee Pool Spa Resort, CELES Beachfront Resort Koh Samui and Thai Airways. 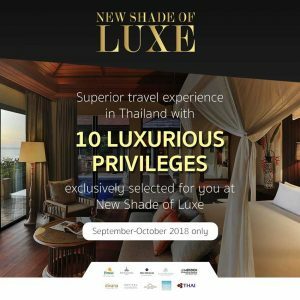 Visit our website www.tourismthailand.org/newshadeofluxe and select your preferred privilege you will then be given the code to redeem the special privilege from our partners. Reward yourself NOW! until 31st October.